KING’S LYNN mauled the Leicester Lions to secure a sensational top spot of the Premiership league table. The Tru Plant Stars comfortably KO’d the midlanders in their double-header at the Adrian Flux Arena. They ran out winners by 56-34 in the first meeting and then 60-30 second time out to easily secure their place at the top of the league. Allitt said: “Once Belle Vue had qualified earlier in the night it was our first choice. We’ve won at the National Speedway Stadium twice this season already. “We are very proud to finish top of the league but that’s done now. Now we have to go on and finish the job starting with the Belle Vue clashes. It was always going to be a case of Lions to the slaughter at the Adrian Flux Arena last night, especially after Scott Nicholls was ruled out with a broken ankle just hours beforehand. The results were never in doubt with Robert Lambert once again the talisman, with paid 14 in the opener and then a paid maximum in the second meeting. Adam Ellis also proved to be an excellent guest in place of Ty Proctor with a bundle of wins in both meetings. 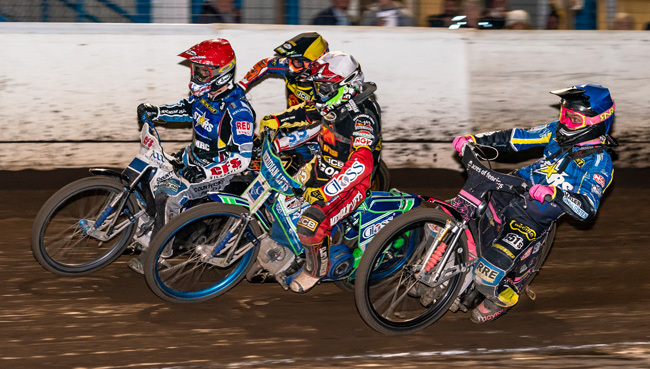 But the strength of the Stars was once again the engine room consistency with Niels-Kristian Iversen, Erik Riss, Thomas Jorgensen and Michael Palm Toft all piling in big points.